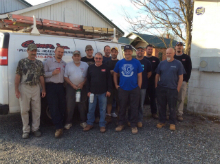 Conner, Inc. has been a local, family-owned business, located in Denton, Maryland since 1987. We specialize in Plumbing & HVAC services. 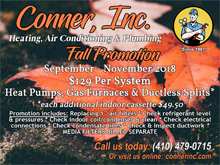 Thank you for choosing Conner, Inc. as your preferred HVAC & plumbing partner! To learn more about the vendors we use, click here for more information! We also accept check or money order. If you have any others questions about payment options, please contact us here.